Many things are greatly simplified from the previous version 4.2.1vm. 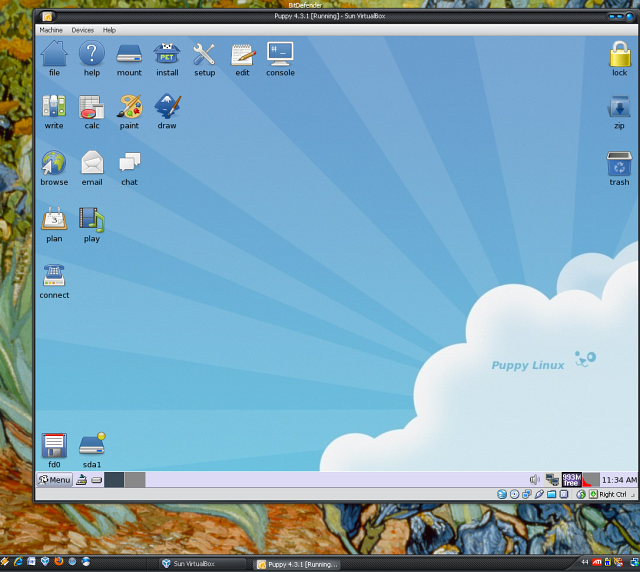 This is Puppy 4.3.1 running in a virtual machine for the program Sun xVM VirtualBox. I find this the easiest and most reliable way to run Puppy when I have to be working in Windows. This is a full implementation and it enables sharing files between Puppy and Windows as well as copying and pasting text between Puppy and Windows. It runs in a window on the Windows desktop or it can run full-screen. VirtualBox was originally based on Qemu, as I understand it, and now has an Open Source Edition as well as a proprietary edition. Both editions are free of charge; I use the proprietary edition which has USB and SATA support. VirtualBox runs for me when Qemu and the qemu-based puplets won't, and I believe it also offers more features than the qemu-based puplets. 2) download and unpack this zip archive of Puppy431rc2.zip; the archive is 254MB and the unzipped folder is 274MB (the increase over Puppy 4.3.1 is to install the VirtualBox services in order that all features will work). 1. You can either create a new folder on the host to share or you can use an existing folder. 2. Right-Click the folder icon in the tray at the bottom right corner of VirtualBox, Click the Add New Shared Folder icon and navigate to a folder to share on the host machine; VirtualBox will provide a "sharename" to refer to that folder (or you can make your own sharename, for instance, Puppy). 2. Then create a folder in puppy (for instance, /mnt/Puppy) to mount the host file on. Adjust Video Memory: The process of cloning somehow changes the video memory to 4MB; that works but I adjust it to 8MB by clicking Display. Autoresize desktop. What works is this: 1) drag the corner of the window to whatever size you want; 2) Right-Click on the Puppy desktop and choose Menu -> Shut down -> Restart X server. By using this kludge one can use the Autoresize feature. 2. Download and install kernel sources sfs and devx sfs in order to run the "Guest Additions" install program to compile and install the VirtualBox Guest Additions. The Guest Additions are the modules and processes that enable the feature set. 3. Mount the Guest Additions program by Machine -> Install Guest Additions, and then click the CD icon to open Guest Additions (which are mounted on the CD). Then Right-Click in the white space of the CD window and choose Window -> Terminal Here--you can enter ls in the terminal to make sure you are in the proper directory. In the terminal enter "./VBoxAdditionsLinux-x86.run." (Don't forget the begin the command with "./" period forward-slash) to indicate that the file is in the current directory. It will end by telling you that the X Windows services were not installed. 5. Add these three lines to .xinitrc to start the start the X window services. 6. The hardware probe for xorgwizard was not working right with VirtualBox and the screen went black (and that was before I did anything); this made it difficult to get any X-server running. This process seems to work reliably: 1) choose Xorg in xorgwizard; 2) when the screen goes blank, hit the down arrow 15 times, press Enter, hit the down-arrow twice, press Enter twice. This gives a 1024x768 desktop. 7. Before I made the version here, I removed the kernel sources and the devx sfs's, and then "File -> Export Appliance." Good work, and thanks for linking to vPuppy (214Rx5) too. Now we have 2 virtual pups for Windows refugees. Of course there was always qemupuppy by eric veenstra. Thanks playdayz. Virtual box is really amazing. I have used Qemu and Vmware and had concluded that virtual machines are always slow and unresponsive. I tried Virtualbox and I can work at the same speed and performance as that of the host machine itself. This is great.. but... as a complete noob I don't know how to do all the things you did. Although I have been using *nix for a long time now, so I dont need it for myself. But its good for people and noobs who are scared that a live CD may mess up their system!! I just registered (this is my first post) to give you my thanks and kudos for your efforts. I have always wanted to try linux and, thanks to you, I did and everything worked like a charm on my XP box. This is a keeper! It would be really great if you could package your vm with wine already installed. PS: I did make try to install wine from a .pet distribution but got some dependency errors. EDIT: Also, I'm running short of hard disk space. Is there a way to reduce the maximum hd size from 8GB to 4GB? Thanks. hey soccerfan, k-melonians do seem to gravitate to linux running k-meleon in wine in Puppy was the first thing I did with wine--i have the best luck with Fred's remixes for Linux. That is a good idea to put wine in--i use crossover myself but that is commercial so i could not include it--it should not be hard to prepare a version with wine though--i'll put some energy that way--maybe even include a few of my favorite programs. i have prepared a "wine bottle" with some programs like k-meleon and foobar2000 in it--it is on the forum somewhere--i'll see if i can still find it. also, there is at least one pet of wine that i have used successfully. i will look for that too. disk space expands as you need it, up to a max of 8GB, but once it has expanded it never contracts. you might not actually be using 8GB unless you have added a *whole* lot of stuff. the actual size of the disk file in the distribution is only 300MB or so. That is a good idea to put wine in--i use crossover myself but that is commercial so i could not include it--it should not be hard to prepare a version with wine though--i'll put some energy that way--maybe even include a few of my favorite programs. check out your "wine bottle" with some other goodies included. Btw, I was able to run proxomitron without problems with wine 1.1.23. I have found that technosaurus's wine pet is so good that nothing else is needed. Just download the pet and click to install. (You can delete the pet after install to save space.) Then download the installer for whatever windows program you want to try and click the installer. Technosaurus has set it up so that ".exe" files automatically start wine. The installer will run and when it finishes there will be a desktop file in /root/.wine/drive_c/users/root/Desktop. (To see /root/.wine...you will need to click the eyeball in the Rox toolbar to see hidden files.) You can click that file to run the program or drag the file from there onto your Puppy desktop to have an easy icon to start the program. Thanks playdayz, I'll give winepet 1.1.28 a try. I too had the problem with fonts in kmeleon and, for me, dingbats seemed to work ok.
As for ff352, I'll pass. I prefer the 1.1.x versions of seamonkey. Puppy as guest with Vista SP1 as host. Took some fiddling to get 1280x800 sreen res running. btw: can I upgrade this version to puppy 4.30 without losing vbox additions? Please view the first message in this thread for the details.